Earlier this week I found myself stuck at a “doctor-y” event. As I made small talk with a colleague, I mentioned that I was training for a marathon. Despite that fact that I am currently blogging about running and training consumes most of my thoughts, I promise I don’t talk about it incessantly to random people, but in this instance it did come up in conversation. My face turned beet red and my blood began to boil. Then without thinking I pulled my hand back and smacked her right across the face, leaving a bright red hand print on her left cheek. She was was stunned at first, but then her instincts took over and she kneed me in the gut. Before I knew it, we were in an all out fist fight in the middle of a cocktail party. My husband broke up the fight, but not before someone called the cops. I am currently writing this from jail. Ok. So, nothing in italics ACTUALLY happened (except in mind. repeatedly. for about a week). In reality I smiled and walk away, like a good girl, who didn’t want to have to explain a criminal record. Obviously in a state of pure boredom, I decided since there was nothing else going on in my life, I would run a marathon. I’m busy and so are my running mates. The expenditure of our time is not something we take lightly. We all have a lot on our plates, but like all things that are important to us, we are finding the time for this marathon. How do I find the time for this? 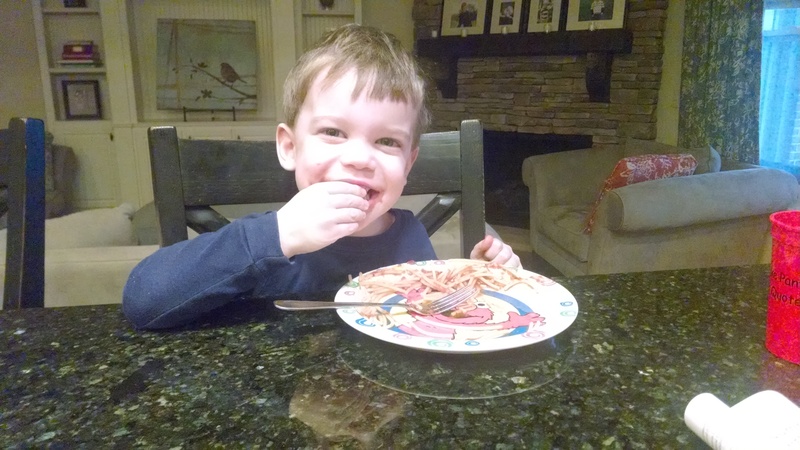 We are following Hal Hidgon’s Novice 2 training program. The best way to avoid injury and reach my goal is to stick to the plan as close as possible. Each week I check off my boxes as I pound out each mile. The only time that works for me is mornings. Some mornings have been painfully early and cold, but nevertheless I’m out there. When my alarm goes off at 5:30 and I check the temperature and it’s 13 degrees, knowing that my friends are out in the Arctic air waiting for me is what gets me out of my cozy bed. There are 6 of us training in the neighborhood. Though we can’t do every run together, we are each other’s cheerleaders. I have missed a few workouts. If I’ve been at the hospital all night delivering babies and I have to choose between running and sleep, then I choose sleep. I don’t make up my runs in the evening, because that’s my family time. Yes, my Type A personality would like to follow the plan to perfectly, but life happens and that’s OK.
Obviously, somebody has to get the kiddos ready in the morning while I’m out torturing myself, and that somebody is my super husband. You need your spouse to be supportive (or a least tolerant) of your crazy hobby when you start logging this many hours. Despite all the crazy cold weather we have had, there has been no snow in Middle Tennessee. 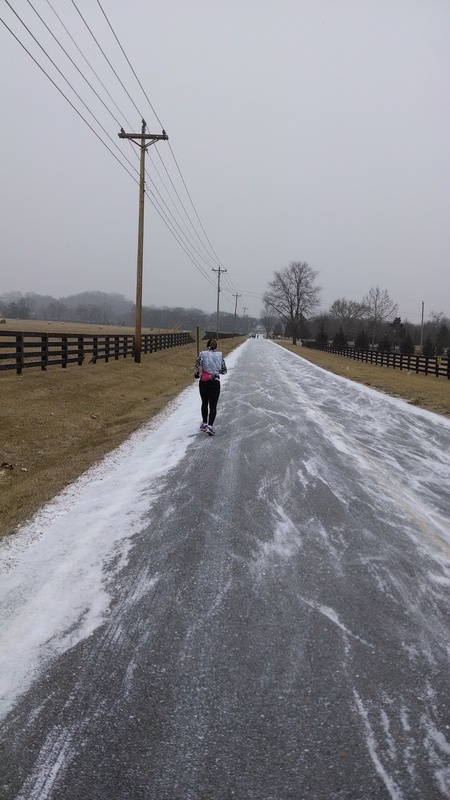 This week on our long run we got a light dusting of snow through our entire 15 miles. It was a gorgeous treat. It melted off within a few hours, so most people who slept in that day missed the “snow” completely. 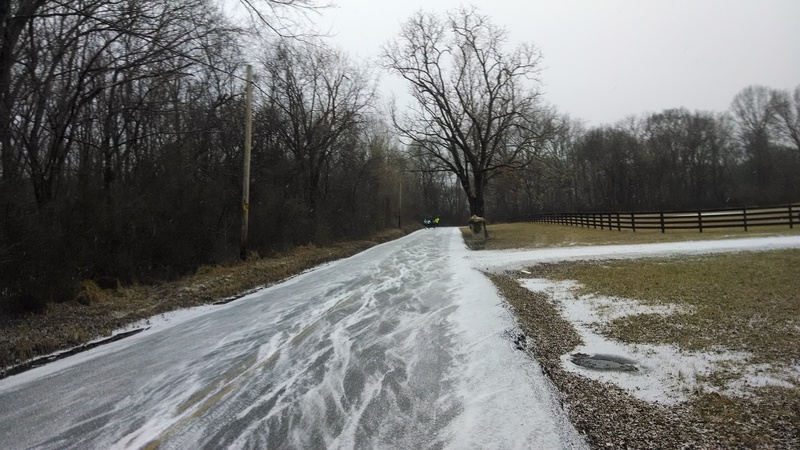 The temperature was 30 degrees (warmer than what it has been), so it didn’t feel that frozen. Sickness hit our little running group hard this week, so only Shannon and I made it out for the long run on Saturday. Andrea and Christina had to bust out their 15 miles on a treadmill, which I think is insane and should earn them extra awesome points for the week. We felt strong through most of the run, except miles 12-14 were tough. I got a boost of energy for the final mile back into downtown and finished strong. 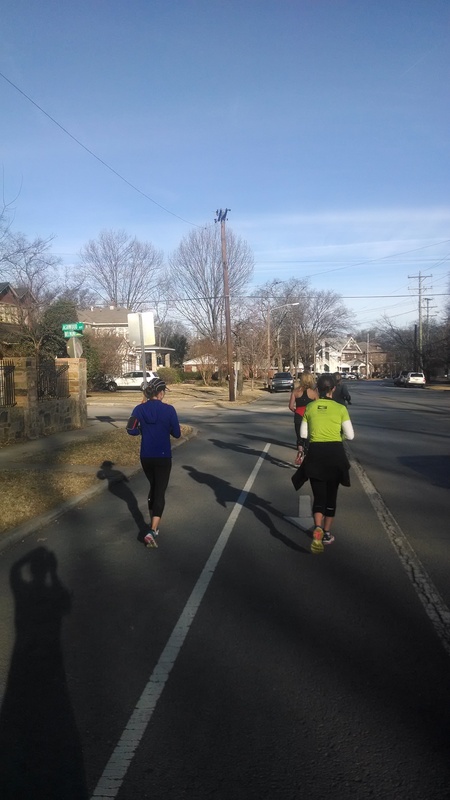 Next week we are doing the Hot Chocolate 15k in Nashville for our long run. Looking forward to the race (and chocolate). What better way to spend Valentines weekend? 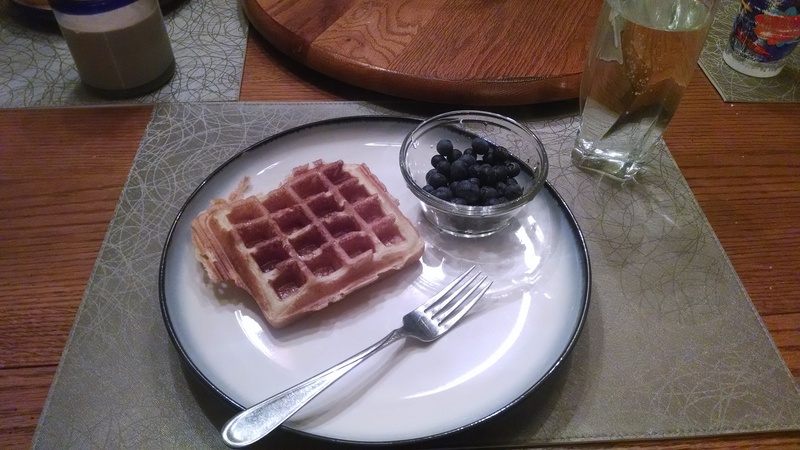 This entry was posted in Humor, Running and tagged country music marathon, marathon training on February 14, 2014 by drrupe. As a OB/GYN, my life is rather unpredictable. I can’t really tell my patients, “Hey hold that baby in for another hour, while I log 4 more miles.” This week was one of those crazier weeks at the office, causing me to miss one of my runs and reschedule a crossfit workout to Thursday. In addition to work’s stress, this weekend’s impending 14 miles long run was haunting my thoughts all week. It would be the farthest I ever ran. My Thursday WOD (workout of the day) was insane. It included 100 wallballs, 75 burpees, and a new exercise that KILLED my quads called ‘little man in a tree’. I hate that little man. Luckily, I had Friday as a recovery/rest day. When I took my first step down the stairs on Friday, my quads nearly buckled out from under with me. The pain felt like a thousand tiny daggers were stabbing me in the leg. I was not injured, merely sore. So stupidly sore that I had to walk down stairs side ways. Friday I hydrated, carb loaded and stretched to get ready for the big run, reassuring myself I would feel better by the next morning. 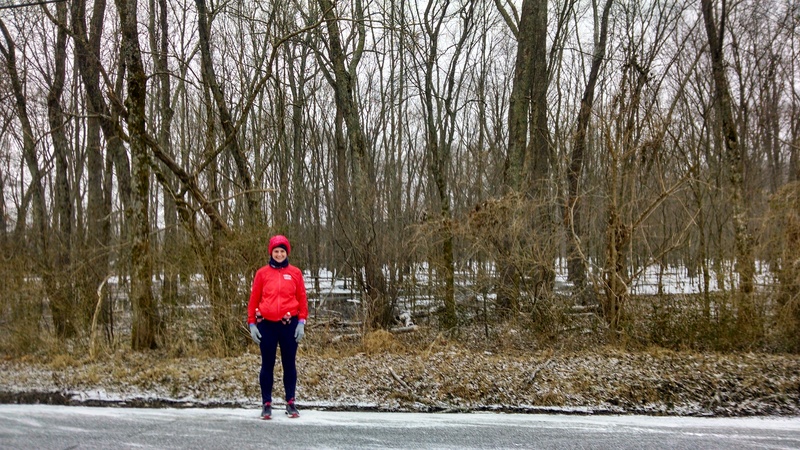 I was hobbling Saturday morning, but the long run was still almost perfect. 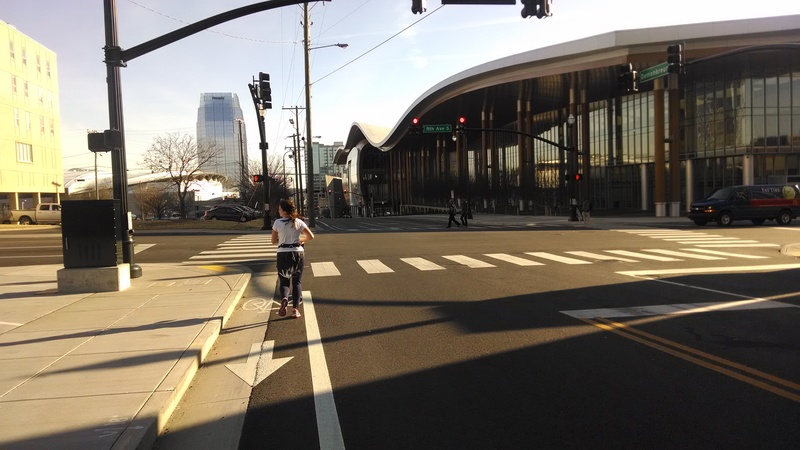 After weeks of running circles around or neighborhood in the freezing dark, we got to run 14 miles in 45 degrees through the heart of Nashville. 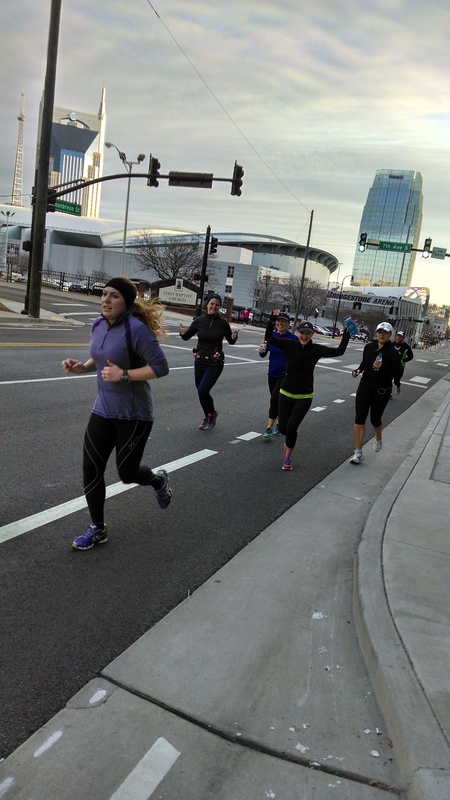 Nashville striders organizes training runs for the Marathon, complete with water stops and signs. It was great to simply show up and run and not have to worry about the course or getting lost. 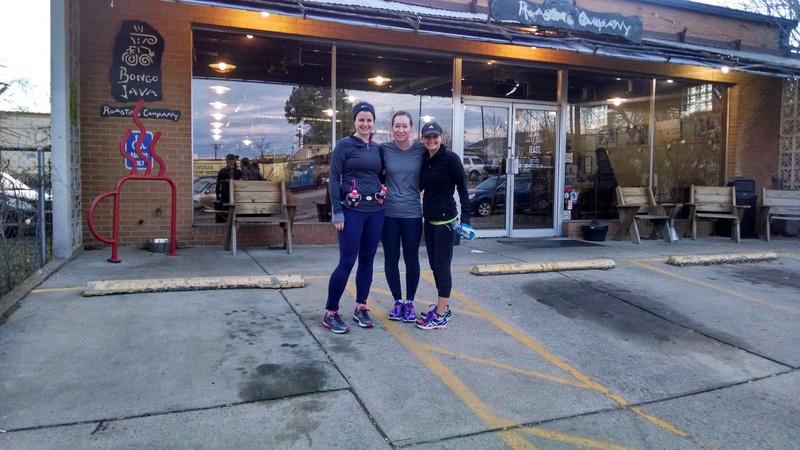 The course was 7 miles out and back from Bongo Java in East Nashville to Bongo Java in West Nashville. My legs were really sore and tired from the beginning. I was hoping they would loosen up in a few miles. While the sharp pain with each stride went away at about three miles, they felt sore the entire time. 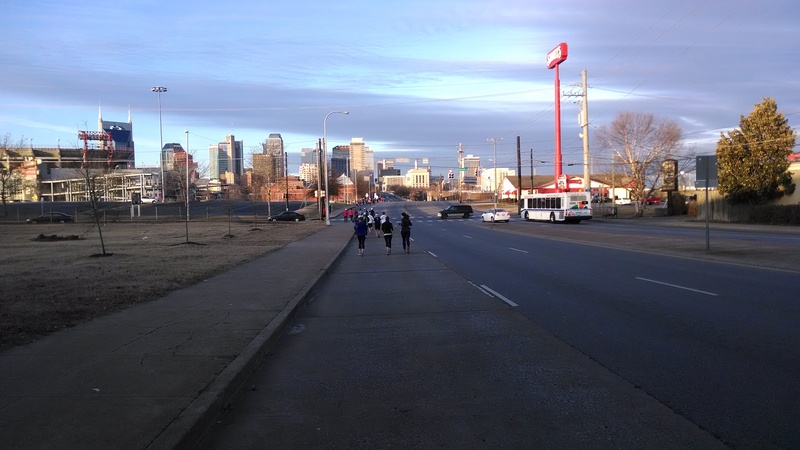 My favorite stretch was running past LP field right after sunrise. It was light enough to dodge the road kill, but left over shimmers of pink and orange were still peaking over the horizon. (this picture does not do the view justice). The energy of running with the crowd (and also lots of goo) really helped me get over my tired legs and the mental challenge of running further than I’ve ever gone. The course took us through the heart of downtown, so there was always something to look at, distracting us from from the fact we were running so far. The final 2 miles were the toughest. Last weekend when we did 12, and I remembered how tired my legs were. I wondered how I could do another 2 on top of that, especially since my legs felt like crap. My friend Shannon is the training for her fourth marathon (the rest of us are newbies) and had the best advice. She encouraged me the the last mile always feels like your legs are dead, no matter if you’re running 10, 15 or 20. So much of it is mental, just push on through. The last few miles were also ridiculously hilly, but her words kept me going all the way back to the coffee shop. We got back to Bongo Java and cooled down. I’m so thankful for them letting us use their facility, they even provided free coffee (that I accidentally poured in my water bottle as I was still in my post run delirium). 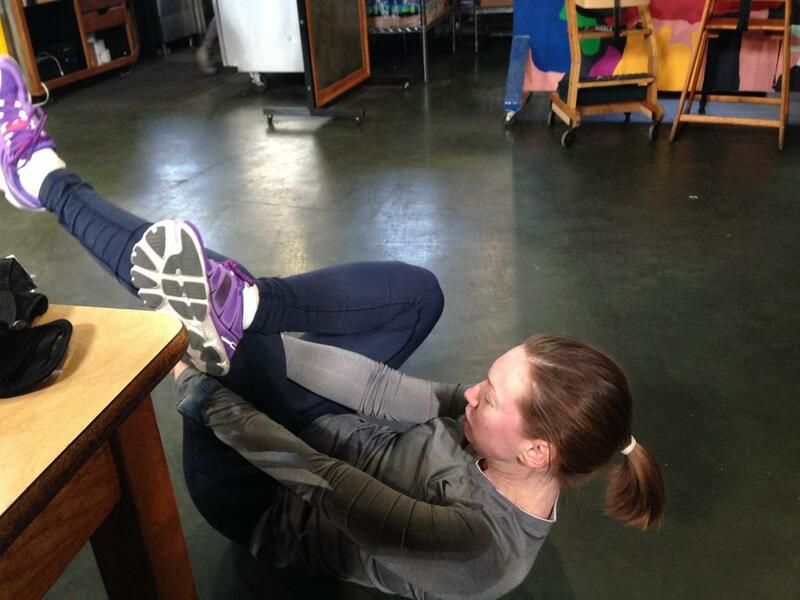 It is socially acceptable to stretch on the floor of a coffee shop, right? We made it ALL 14 miles. The farthest we’ve ever been. It really helps that we are doing this together. Honestly, 15 next week doesn’t seem quite so scary now. 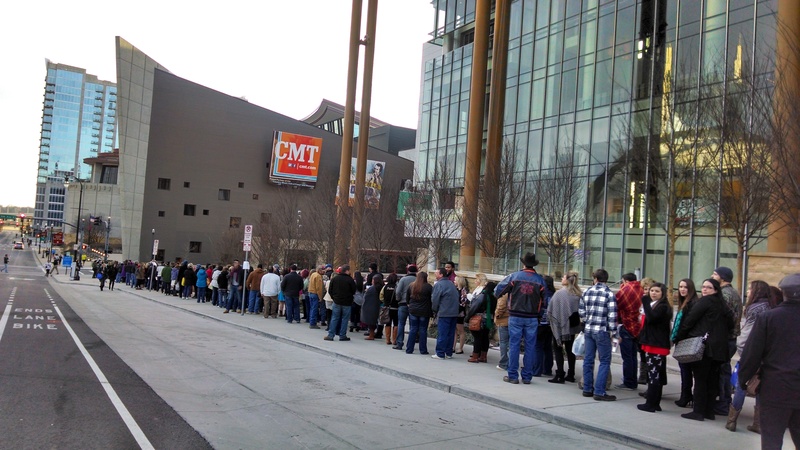 This entry was posted in Running and tagged country music marathon, crossfit, marathon training, Nashville Striders on February 6, 2014 by drrupe.